Orange bags: Best you buy your own. "For now, it's the only way to keep Durban’s Orange Bag recycling project alive," says Consumerwatch’s Wendy Knowler. The Orange Bag recycling project started off as a big moment for the city. Durban Solid Waste (DSW) showed the rest of the country’s large municipal waste departments the way by providing a mechanism for residents to separate their waste in their homes, and divert a meaningful percentage of it to recycling plants, so that waste didn’t end up in the landfills. Paper and plastic went into the orange bags - supplied free by the municipality, and later, glass and cans into thicker clear plastic bags, also supplied free. It was back in 2016 that Orange Bag supply started to become really problematic. They weren’t being tossed into residents’ yards as before, so many, myself included, took to going to DSW’s offices in Argyle Road to collect a pack of orange bags. DSW told residents to use the thick clear bags intended for glass and cans, for their paper and plastic, which was very far from ideal, being too small and too expensive for the job. Then came the monster storm of March 10th back in 2017, which wiped out the recycling holding point south of Durban, so the bags weren’t collected for a while. And still, Orange Bags were in very short supply. Then came the revelation, in February this year, that the tender process for the awarding of the contract to supply those orange bags to the city was fraught with irregularities and a company which lacked experience and technical knowledge had ended up with the contract. A few weeks ago, the supply of Orange Bags dried up altogether - not even the DSW depot had any. 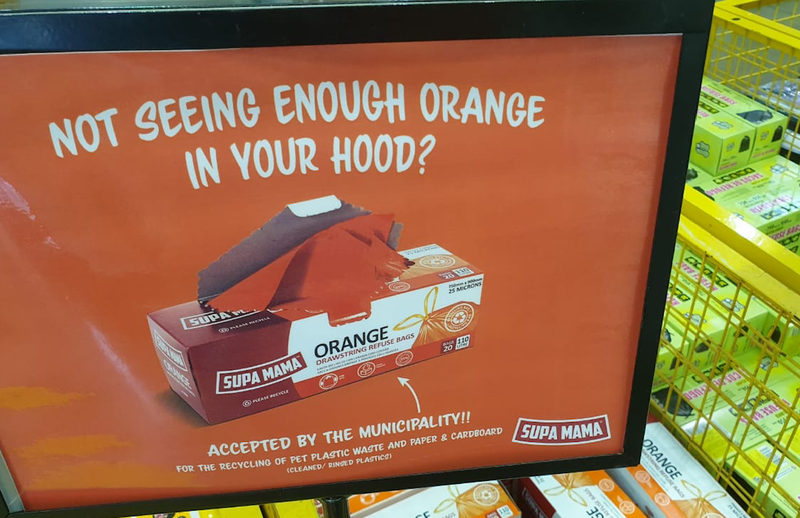 In recent months, Durban-based plastic bag manufacturer, Verigreen, makers of the Supa Mama brand, stepped in and started producing Orange Bags, which are on sale in Checkers and Builders Warehouse for about R40 for 20. I discovered this at the Riverhorse Builders at the weekend, thanks to a sign: “Not seeing enough orange in your ‘hood?”. The city’s recycling partners are removing them from verges, so this is a way to keep the Orange Bag project alive, albeit at a cost to residents of around R2 a bag. Ironically, Verigreen, a 100% black-owned company, has several times unsuccessfully tendered for the official municipal Orange Bag supply. “In response to the Orange bag outcry, we decided to launch our own brand of orange bags for recycling, to help diehard recyclers,” said co-owner Mike Maziya when I quizzed him about him about the Buy-Your-Own orange bags. So how likely are we to get free orange bags out of the municipality again? About a month ago when I asked that question of the City’s communications division, I was told that orange bags would again be available by the middle of September. Clearly, that didn’t happen. Recycling volumes are down 20% due to the bag supply problems, he said. Frankly, I’m surprised the impact hasn’t been greater than that. Asked whether the City supported Supa Mama’s sale of orange bags, Nsele said: “Recycling is a key focus of the City, any initiative involving recycling will be encouraged and supported. We are hoping in a month or two that the orange bag issue will be resolved. “To the residents who are buying their own bags, we thank them for keeping the recycling initiative alive." So buy those orange bags - the Supa Mama brand or any other - and get your paper and plastic out on the verge in them. DO PUT IN: Newspapers, magazines, paper, flattened cardboard, milk cartons, water and juice bottles, Tetrapak juice cartons, big yoghurt tubs, polystyrene, egg boxes. DON’T PUT IN: Plastic fruit and veggie trays, those small six-pack yoghurt tubs, Pringle tins, tin foil, food, glass, bottles, garden refuse, pet pooh, chemicals, stompies.